Two Palestinian terrorists broke into a Synagogue in Jerusalem Tuesday morning yielding guns, knives and a meat cleaver, killing at least four worshipers, there of whom were Americans wounding at least eight, four of which are in critical or serious condition. According to Israeli Police the two Palestinian terrorists entered the Kehilat Yaakov synagogue on Shimon Agassi St. in the Har Nof neighborhood at about 07:00 a.m., during the morning minyan prayers. They opened fire with weapons and struck worshipers with a meat cleaver and knives. Two police officers in were able to shoot and kill the assailants, but not before one of policeman was attacked. He is now in critical condition (there are unconfirmed reports that policeman has died). 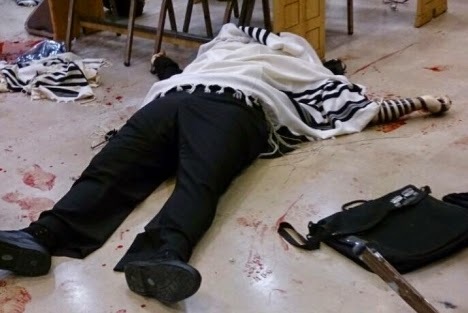 This is the first time Palestinian terrorists have targeted and murdered worshipers inside synagogue (there have been attacks outside synagogues). Shas Party member Aryeh Deri, who was in the Shul during the attack, and told Army radio there was blood on the pews and floor, with wounded and dead worshipers still wrapped in talit and tefillin. “They were shouting ‘Allah Akbar,’ as they carried out the attack,” he said, and tried to call police as the murder spree unfolded. The assailants cut off the arm of a worshiper wearing T'fillin (phylacteries, a religious article Jewish men put on during prayer) the organization said in a statement. Police ground units and helicopters are looking for a third accomplice, who drove the vehicle that transported the two. “This is the direct result of the incitement being led by Hamas and Abu Mazen [Palestinian Authority - PA President Mahmoud Abbas], incitement which the international community is irresponsibly ignoring. “We will respond with a heavy hand to the brutal murder of Jews who came to pray and were met by reprehensible murderers. We will respond harshly,” Netanyahu said. In recent weeks leaders of the Palestinian Authority and the Fatah party, both controlled by President Mahmoud Abbas have been calling for violence in Jerusalem. An incitement that has been ignored by Israel's 'friends' in the Obama administration. Foreign Minister Avigdor Liberman called on the international community to respond to what he said was Abbas’s anti-Semitic incitement, which caused the attack. Rabbi Moshe Twersky, 60, a senior member of the local Torat Moshe Yeshiva was the first victim named by Israel Radio. Twersky was the son of Rabbi Isadore Twersky, the founder of the New Harvard Center for Jewish Studies. US Secretary of State John Kerry called Netanyahu to offer his condolences and called on President Abbas to end the incitement of violence (about time). Hamas and Islamic Jihad praised the bloodbath, with a Hamas spokesperson saying it was a "response" to the suicide of an Arab bus driver Monday, which Islamists have nevertheless been blaming on "Israeli settlers" in order to stoke further tension. 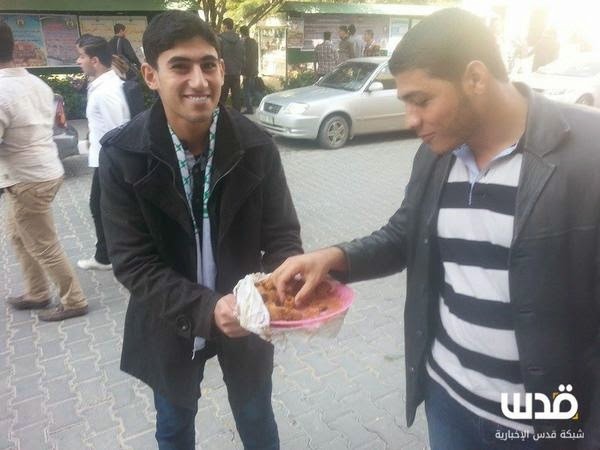 An official statement from Abbas’ office said ”The presidency condemns the attack on Jewish worshipers in their place of prayer and condemns the killing of civilians.” However as is their practice of saying one thing to the world community and something else to their own people, the Palestinian Authority's official TV channel showed images of Bethlehem residents handing out candy in the streets, in support of the attack. The two The Terrorists Uday and Ghassan Abu Jamal, in their 20s, were members of the People’s Front for the Liberation of Palestine.A police spokesman told Army radio that the two terrorists, cousins, were residents of the capital’s Jabal Mukaber neighborhood. One of the terrorists apparently worked at a convenience store on the same block as the synagogue. The Israeli government is convening their security committee to determine a response. You know what's even worse? After he'd created the first template the actual work was done. All he had to do then was sell it to the states, for the same price the first one paid. Nice gig. Where do I sign up?